First Month Rental. For your convenience to assist your move-in we will Pro-rate your first month storage unit rental on a daily basis, from the day you sign your rental agreement to the end of the month. One Month Security Deposit. This deposit is fully refundable when you vacate your storage unit. $15.00 Administration Fee. This one time fee is incurred when you complete your lease agreement. $11.00 Lock Fee. Reimbursement of $5.00 upon return of all keys. 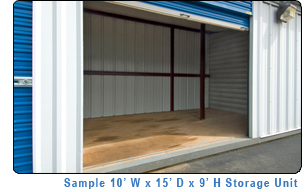 Thank you for considering U-Store Self Storage for your personal storage needs.